Salmon is tasty and nourishing, widely regarded as super healthy food. It’s pretty easy to cook it. Oh well, often times, we don’t cook salmon at all simply because sashimi is super delicious. Other than enjoying sashimi, we love baked salmon very much. This baked salmon parcel was only cooked with basic and simple seasoning, yet with great satisfied results. The big fragrance of lemon and herb is so refreshing and tempting. We didn’t have any rice at all, although we are big fans of rice. I simply cooked some fresh corn cobs, green vegetables, and sweet potatoes to go with this dish. We were so full already and felt very satisfied. Preheat oven to 180C / 350F. Mix all the ingredients of sauce well. Set aside. 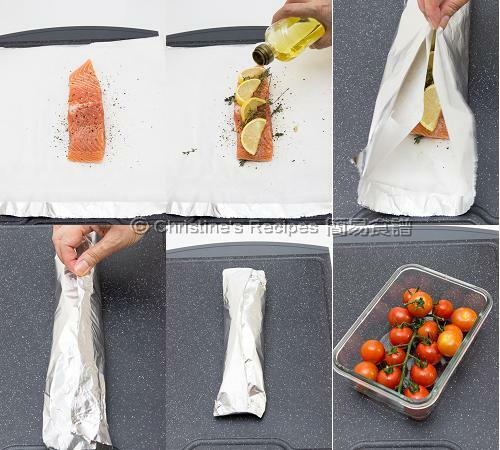 Prepare a piece of foil with baking paper on top, large enough to wrap up the salmon. Place the salmon on the baking paper. Season with salt and pepper. Cut the lemon into two halves. Slice one half of lemon and arrange them on the salmon, with thyme on top. Drizzle some olive oil. Reserve the other half of lemon for dressing. 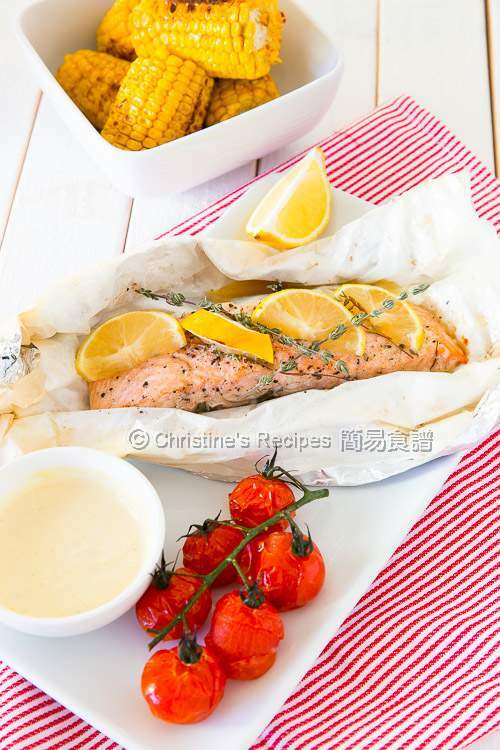 Fold over the edges of the foil and baking paper together to enclose the salmon fillet like a parcel. By doing this, the salmon will absorb all the fragrance of the lemon and thyme. Transfer onto a baking sheet. Season the cherry tomatoes with salt and olive oil. 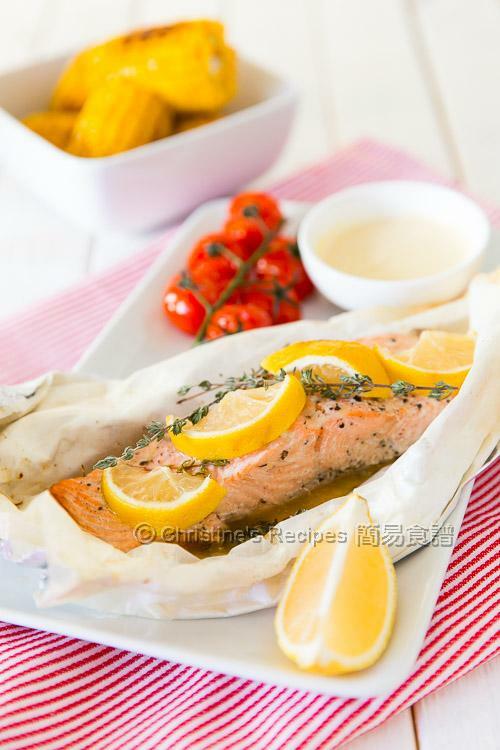 Bake in the preheated oven with the salmon parcel together, for about 8 to 10 minutes. Take out the salmon parcel and rest for 3 minutes. Remove the foil and baking paper. Serve hot with cherry tomatoes, sauce on side for dipping. Salmon with skin can be used instead. Most importantly, remember to remove all the bones inside. Kewpie mayonnaise, a kind of Japanese sauce, goes so well with salmon, just like the sushi you enjoy in Japanese restaurants, available at supermarkets and Asian grocers. The way of folding the foil and baking paper is up to you. Make sure they are large enough to seal the salmon fillet properly, not letting any sauce leak out. My mouth is watering terribly...your family is so lucky having you cooking for them.